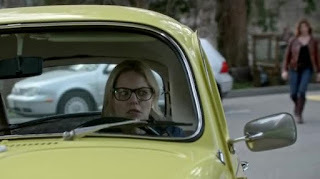 What I like most about the episodes that delve into Emma’s pre-Storybrooke past is that they always provide a welcome change from the usual escapades that are spent trudging around a monotonous green landscape, and show us a world where things are a little less idyllic and a bit rougher around the edges; not unlike Emma herself. ‘Firebird,’ while somewhat flawed, gave us some interesting insight into what made Emma so tough in the first place. We also learned how Emma got her jacket. Maybe the second part was a little unnecessary? Back in 2009, which I’m assuming is two years before Emma arrived in Storybrooke, our blonde hero was a scattered, stubborn young girl desperate for answers about where she came from. Enter Cleo, a somewhat absentminded bounty hunter who taught Emma to find her own “armor,” to protect her heart from the emptiness she had been feeling as she chased answers about who abandoned her. I like the idea that Emma would have been inspired by someone like Cleo back in the day. She was a role model of sorts who had a similar void that she could never fill. It would make sense that she would take Cleo’s advice to protect herself. I don’t like that Emma’s stupidity got the woman killed after a botched attempt to find missing records on her past (surely an unarmed robbery wouldn’t be met with such a hostile reaction on the cops’ part? ), or that a huge life event like this would be buried for so long, but considering how little we actually know about Emma’s life before she got to town, it isn’t a massive stretch; for Once anyway. In the Underworld, Emma had to finally accept that Hook has to stay put in the Underworld, despite everything she had done to get him out. Before Emma left him behind, he reminded her to not put her armor back up, and to learn to let him go. It’s a nice sentiment, but I wonder why the flaws in her plot to escape didn’t hit her a little earlier. If only it had dawned on her before she dragged her whole family into a dangerous situation, with no plan in place? Now Hades is loose in the real world, something I doubt the Charmings will let stand for long. Zelena might prove to be a major obstacle, though. Will she let them stop the Underworld’s former leader, or will she sacrifice all the good she’s done to prove he can be saved? No Ginnifer Goodwin again this week. Is this part of her maternity leave? LOL at Stealthy making an appearance. Five seasons later and it’s still funny. I loved the Cruella/Blind Witch duo. It’s sad they’ll most likely never be seen again. Rumple managed to get out of the Underworld with Belle “safe” in Pandora’s Box. I doubt opening that will be simple. I’m so relieved that Robbie Kay’s eyebrows didn’t make it out of the Underworld with everyone else. Emma’s red jacket came from a store where Cleo’s long lost daughter worked, which was a cute idea. It’s hard to get past the underlying problems of ‘Firebird’s flashbacks, but there was a great sentiment behind them that felt important given what Emma had to endure in the present day. How she handles her failure in the coming episodes will be interesting to see, especially since she didn’t get out of the Underworld without a few problems following her back home.